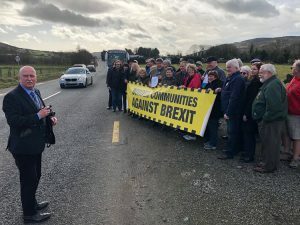 A delegation of forty AOH and LAOH members met with the group known as Border Communities Against Brexit in Newry, the city referred to as the “Gateway to the North” on the border of County Armagh and County Down. 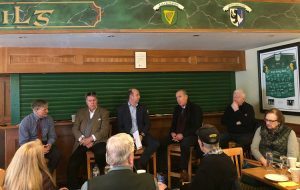 The encounter followed a discussion at Dromintee Gaelic Athletic Club, as part of the first stop on the delegation’s Freedom For All Ireland Tour of Ireland. A panel including National President, Judge James McKay, National Freedom for All Ireland (FFAI) Martin Galvin, and Border Cross-Community leaders Damien McGenity, Declan Fearon, and John Sheridan discussed the impact Brexit will cause to All Ireland economics and the peace process. 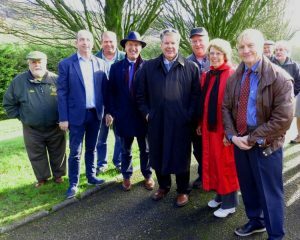 The Border Committee Against Brexit members thanked the Hibernians for their continued commitment to fighting against Brexit and for Irish peace with justice and unity. 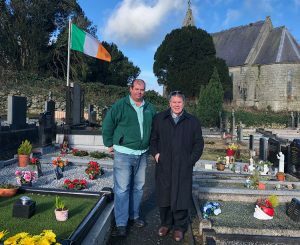 They also stated their appreciation to Irish Americans for encouraging their federal and state legislators to stand up for the Good Friday Agreement and the peace process. Charlie Casey, President of Newry AOH and a Newry legislator welcomed the group at their first stop.